The first step in understanding your hearing is to have a hearing assessment. This will measure how well you recognise sounds across different frequencies and intensities. The resulting audiogram forms the basis for any further treatment. What should you expect from your first appointment? When you make an initial appointment with Aston Hearing, we will invite you to complete a short self-assessment, so that your audiologist knows a little about your hearing situation before you first meet. In the consultation, the audiologist will examine your ears and auditory canal and note your aural medical history. Pure tone audiometry is then carried out. This is a non-invasive test that reveals the quietest sound you can hear at different frequencies, and produces an audiogram, which highlights the exact areas where you may be experiencing hearing difficulties. Your audiologist will then explain the audiogram to you, discussing the nature of your hearing loss and how your hearing capabilities could be improved. This does not always mean hearing aids – many clients leave our practice with a range of communication strategies that will help them to manage their day-to-day communication issues. If your audiologist feels that you would benefit from amplification they will recommend suitable hearing devices. These will be discussed in your appointment and also written up in a report for you to consider in your own time. The hearing assessment costs £60, and there is absolutely no obligation to return to Aston Hearing for any follow-up appointments. A full report of your hearing situation is included in the price of the assessment, along with any medical referrals should you need them. If you are interested in hearing aids but do not quite feel ready, you are welcome to come back to us at any time in the future for a follow-up appointment. When you get your hearing assessed your audiologist will plot your hearing on an audiogram. This chart indicates the relationship between frequency (pitch) and intensity (volume). 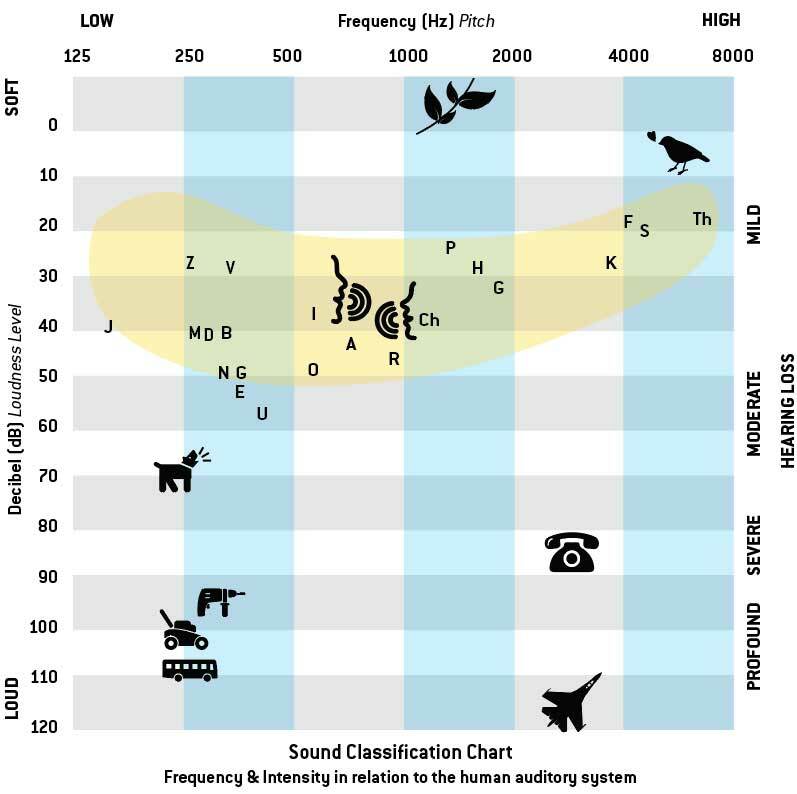 The yellow banana shape in the middle of the chart shows where speech and the phonemes of speech are generally found. We use a chart similar to this to plot a person’s hearing level. It is a very visual way of appreciating the effect a hearing loss will have on a person’s ability to communicate. Order confirmation and contract confirming details of purchase including invoice that is payable at the fitting stage & full explanation of the 60-day Money Back Guarantee. Impression of ear(s) for production of custom-made hearing instrument/mould. Allow 14 to 21 days for production. If you do not wish to try a hearing aid at this time or you would like to consider the options in the comfort of your own home you are encouraged to do so. You will be provided with any medical reports and referrals are forwarded to the relevant people within two days of your initial consultation. Your notes are kept on file for future reference. Should you decide you would like to try a hearing aid at a later date we can pick up from whichever point is necessary. If you decide to keep the hearing instrument/s you are provided with one year’s supply of batteries & accessories, and your hearing aid/s are covered by manufacturer’s warranty for a minimum of 24 months. We will continue to look after you and your hearing aid/s for the life of the aid/s. You are encouraged to come back as many times as you wish for consultations and adjustments within the warranty period; there is no charge for these appointments. Once the warranty has expired you can sign up to the Carefree Club, which gives you the peace of mind and benefits of the original warranty. If you decide not to take up the Carefree Club you are able to “pay as you go” for services as required. The average cost of an appointment is £20. If the hearing aid/s are not proving to be of benefit, simply return them to us, within the agreed returns period, and your money will be refunded in full. There is a consultation fee of £100 which is invoiced at this stage. This is to cover the initial consultation, review appointments, administration of trial and consumables such as moulds and batteries etc. Please note this fee is charged per customer, not per hearing aid – you are not charged more than once, even if you try more than one instrument.